← What are Dental Sealants? Modern science continues to bring ingenious innovations to the dentist’s chair. If you are considering dentures or other options for one or more missing teeth, you might want to consider Dental Implants. If you have had a history of problematic dental issues, this might have left you with the painful effects of damaged teeth or missing teeth. You might find it difficult to eat your favorite foods, or feel as if you have to hide your smile which results in feeling self-conscious and uncomfortable from day to day. 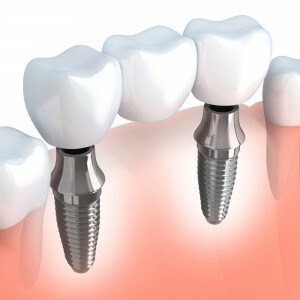 If you are considering dentures to alleviate your symptoms, you may want to consider the benefits of Dental Implants. Variety– Dental Implants can be used for one tooth or several as a bridge. Increased confidence– The Dental Implant will look and feel the same as your original teeth and will not fall out during the day. Your dental health will improve– Dental implants remove the risk of recurring infection and damage to surrounding teeth. Resilience– Dental Implants are as strong as your natural set providing a long term resolution. You can eat again! – You will not have to worry about ordering a steak as Dental Implants will realign your bite. Simplicity– Unlike dentures, Dental Implants simplify your day. They stay in place without the need to remove theme for cleaning or the fussy application of putting them back in. Through X-rays and imaging techniques, the doctor will determine the appropriate placement of the post based on your natural jaw line and teeth alignment. The post is then placed within the jaw bone. The bone will surround the post and fuse together, creating a strong structure to hold the crown. You will be placed on a soft foods diet and instructed to keep the area clean through the healing process. An abutment is attached to the implant. This will hold the crown to the post. It can be comprised of titanium, gold or porcelain. You will have a follow up appointment to maintain the health of your new teeth. Dental Implants offer many benefits and can change your life. Schedule a consult and get started on your new smile!